This post covers yesterday and today. First, yesterday (Thursday). 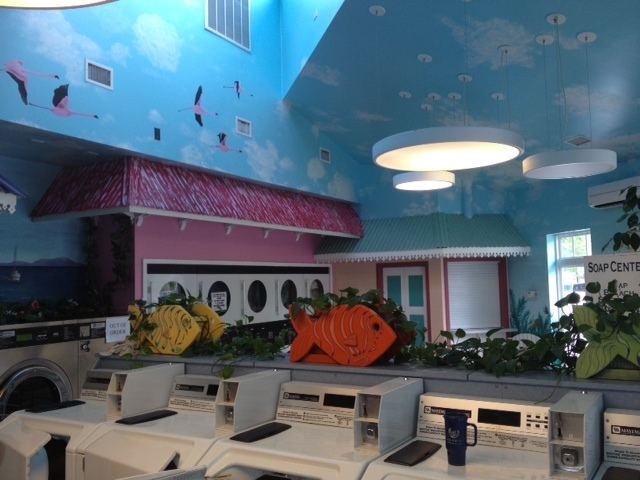 We took about 3 loads of laundry over to the excellent laundry facilities here. We are parked so close to the laundry room that Malcolm was able to use the wi-fi from our trailer while we sat and waited for our laundry to complete. Once we got the laundry done and put away, Malcolm called up his old college buddy Vince, who is a Navy Chaplain over at NAS Oceana (just behind the campground). 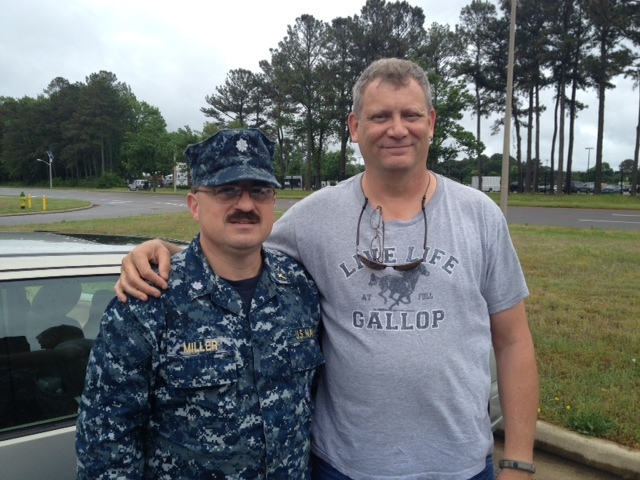 We met Vince at a local Greek restaurant for an excellent lunch, then followed him over to the Navy base and hopped in his car outside the gate. Malcolm with his friend Vince. Vince gave us the grand tour of the base. We stopped and walked around the aviation historical park, where older decommissioned aircraft are on display. 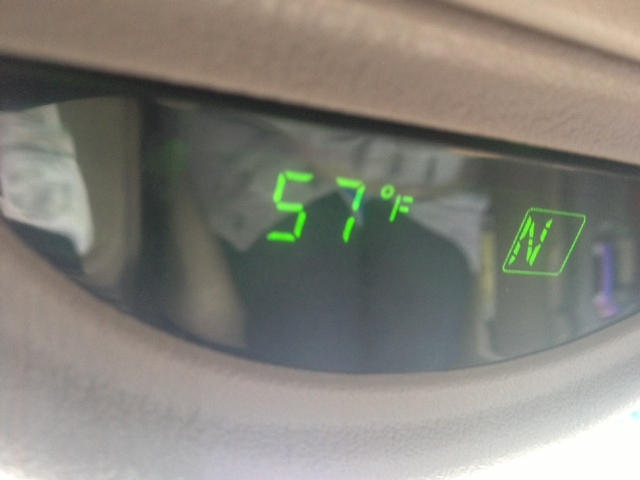 Since it was windy and rainy, we didn’t do too much above driving around the base in the car. Once back outside the gates, we said our goodbyes and Val and I headed to Malcolm’s aunt’s house. We hopped in Malcolm’s Aunt Mary’s car and went over to pick up her grandson to take him to his baseball game. On the way there, we found out it had been cancelled due to approaching storms. We headed back to his house so he could change. His Mom and brother came home, as well. The boys changed into comfortable clothes and we all went out to dinner at a local bar-b-q restaurant, which was really good. After dinner, we drove Malcolm’s aunt back to her house and visited with her until very late last evening (the reason we didn’t blog yesterday). By the time we got back to our trailer (a 40 minute drive) and fell into bed, it was nearly 1:00 AM. This morning, Malcolm’s aunt came over to the trailer to get the tour. We went to lunch at a nearby pizza restaurant recommended by the campground staff (they were right – it was excellent), then drove around town for a while, looking for a mall or someplace to walk. It was windy, rainy and cold (mid 50’s) today, so we ended up just taking a long drive. We headed back to the trailer to visit for a while longer before we said goodbyes and Malcolm’s aunt headed home (Malcolm’s uncle is out of town on a hunting trip this weekend). This evening, we verified directions to our next destination (a friend’s farm west of Washington, D.C.) and Malcolm put some water in the fresh water tank and unhooked everything but the power cord for an easier departure tomorrow. The campground is getting really crowded. There is a live band singing over at the swimming pool. Should be an interesting night. One other thing – when Malcolm mentioned his grandmother’s diaries and logging their travels, Malcolm’s aunt said she had a couple of books. They weren’t diaries, but rather about 10 years of budget information that Malcolm’s grandparents kept during their travels. They have been interesting reading. We might summarize some of that information as an interesting comparison to life today. This entry was posted in traveling, Virginia. Bookmark the permalink.